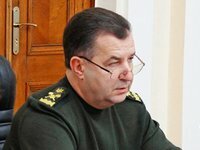 Minister of Defense of Ukraine Stepan Poltorak says there was not enough equipment at the perimeter of a military warehouse near the town of Ichnia of Chernihiv region, where the fire extinguishing continues along with the detonation of ammunition. "…The explosions occurred in such a way that at first there was a clap, then a glow, and then two claps and finally an explosion of ammunition. This indicates a detonator was used to blow up our storage facilities," Poltorak said at a government meeting in Kyiv on Wednesday. Poltorak said it necessary to build closed storage facilities. "It will be possible to reliably protect our reserves when we build closed reinforced concrete structures that will reliably provide protection ... This year we plan to build 15 such storage facilities," said Poltorak. He also stressed: "I personally have no doubt that these were attacks on our depots."